Store cards come with an extremely high annual percentage rate but that hasn’t deterred the 14 million store card holders in the UK. The average store card APR ranges between 25% to 30%, and as this case study shows, it is very easy to fall into the store card debt trap. John Davidson, 29 is employed as a sales rep earning just under £20,000 per year. This was John’s first job since leaving university; not his preferred employment but with £15,000 of student debts John could not afford to wait. John’s employers enforced a strict dress code; suits, shirts and ties. When John applied for this job his overdraft and credit cards were almost at their limit. After receiving an invite for the job interview the first thing on John’s mind was dressing smartly for the interview. He had intended to use the last of his remaining credit card funds to buy a new suit. However, the sales assistant informed him he could buy the suit there and then with a 10% discount and nothing to pay for a month if he opened a store account. After supplying two pieces of identification the account was opened on the spot. "Within 30 minutes of opening the account I had bought a suit, shoes and a couple of shirts totalling £350. With a 10% discount this would mean a saving of £35" said John. At no time was the annual percentage rate mentioned during the entire shopping transaction. "I didn’t give it much thought as I was aware I had just over a month to pay off the balance without incurring any interest" John continues. The interest on the card would turn out to be 29% APR, almost 20% more than his actual credit card APR. John succeeded in obtaining the job and immediately almost quadrupled his store card balance by buying more clothes for work. Within one month he had an account balance of £1200 and no hope of clearing the balance during the interest free period. Instead, with debts still mounting before his first payday John decided to pay only the minimum repayment amount on his store card balance. Although John was now receiving a monthly wage he was barely left with any disposable income after paying debts, rent, and daily living expenses. Within three months he had tried unsuccessfully to prioritise his debts but was in two months arrears with the store card. The interest was mounting up, as were the charges for missed payments. By the fourth month John was issued with a default notice. With no contact from John the store passed the debt onto a debt collection agency who then began sending letters and telephoning John at work. The debt collection agency had also applied their £75 fee to the store account balance bringing the total amount due to £1500. Within four months John had added an extra £1500 to his debts and now had a debt collection agency pursuing him for payments on the clothes he wore to work. With both debts and stress mounting John finally decided to seek help. John explains, "after initially searching the web for a low interest loan to tide me over I came across the Consumer Credit Counselling Service (CCCS) website. I telephoned the free phone number and talked through my debt problems with a helpline advisor who made an on the spot assessment". He was given expert debt advice and given advice on writing to all creditors to work out a lower repayment plan with frozen interest. The advice given by the Consumer Credit Counselling Service was confidential and more importantly, free. The CCCS is a registered charity that does not charge a fee for the advice they give. Within a month John had managed to obtain an agreement to freeze all interest on his debts and the repayments were now also significantly lower. The CCCS offered a number of available routes including an Individual Voluntary Arrangement (IVA). John can now comfortably afford to make repayments without mounting charges and interest. 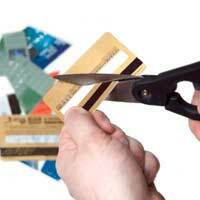 It only took fours months for John’s debts to spiral out of control with the high interest store card kicking up his debt problem to an unmanageable level. Store cards can seem like good value with the initial 10% discount. But unless the balance is paid within the interest free period they can lead to very serious debt problems due to the extremely high annual percentage rate.